You are at:Home»Features»Territorial Sea Act null and void? Territorial Sea Act null and void? ON June 22, 2012, Sarawak and Sabah lost their sovereign rights and jurisdiction over the area of the Continental Shelf, consisting of the seabed and its subsoil beneath the high seas contiguous to the territorial waters of the Borneo states, when Territorial Sea Act 2012 (TSA) came into effect, limiting both their jurisdictions to three nautical miles (5.5 km) from the coastline. The implication is that with the reduced breadth limits of its territorial waters, the state’s rights to fisheries, marine and mineral resources, tourism sites in marine areas and so forth are now confined to only 3 nautical miles (5.56 km) from its coastline. Was the Territorial Sea Act 2012 constitutional? Although Sarawak has yet to suffer the consequences of the passing of the Act, the state has lost all grounds to claim the economic benefits of its territorial waters in any negotiations with the federal government should any disputes arise. The refusal of the federal government to pay petroleum royalty found off-shore of Kelantan because the oil field is located outside the three nautical mile limit is a very disturbing precedent. However, all is not lost yet and Sarawak can redress the situation because the Territorial Sea Act 2012 was enacted in contravention of the constitutional provisions and therefore null and void and of no effect. This was brought to the attention the State Legislative Assembly by Batu Lintang assemblyman See Chee How in December 2015. To back up his contention See told thesundaypost, “By virtue of the lifting of the Proclamations of Emergency on November 23 2011, and pursuant to Article 1(3) of the Federal Constitution, the territory of the State of Sarawak is the territory comprised therein the Federation of Malaysia immediately before Malaysia Day (September 16 1963) and that means sovereignty over the continental shelf as was first laid down by the Sarawak (Alteration of Boundaries) Order in Council 1954. “Article 2 of the Federal Constitution stipulated that the Parliament may by law alter the boundaries to any State but a law altering the boundaries shall not be passed without the consent of that state in a state legislature and of the Conference of Rulers. See spoke on the TSA and tabled a motion calling on the august House to preserve and uphold the territorial integrity of Sarawak and reject the Territorial Sea Act 2012 as well as set up of a commission to look into the constitutional and legal framework for devolution of powers to Sarawak during the DUN sitting. See’s motion was subsequently tabled by Land Development Minister Tan Sri Datuk Amar Dr James Masing on December 8, 2015 with an all round ‘aye’ from the House. In tabling the motion, Masing thanked See for speaking up on territorial rights and calling for a review of all legislations affecting the state’s rights to its natural resources and exercise powers and functions in relation there to under the federal constitution within its boundaries, and upon such review, to amend or repeal such legislations. See had also called on the state government to seek amendments to the provisions in the Territorial Sea Act 2012 to safeguard the integrity of Sarawak’s territorial boundary to have control over all our resources. “Only then will the federal government give us the respect and come to negotiate with us on the state’s rights and interests, under the Malaysia Agreement and expedite the process of devolution of powers to Sarawak and Sabah,” See told The Borneo Post on August 15. In the last DUN sitting (June 2016), Chief Minister Datuk Patinggi Tan Sri Adenan Satem announced the state would be developing a regulatory framework based on the relevant state law for Petronas and its contractors to abide by in regard to their activities in the seabed and sub soils which are part of the state land of Sarawak. He categorically stated the state government had never been consulted before this Act was passed in Parliament. “Section 3(1) of the Act states that the breadth of the territorial sea of Malaysia shall for all purposes be 12 nautical miles. “However, Section 3(3) provides, inter alia, that for the purpose of any written law relating to land in force in Sabah and Sarawak, any reference to territorial sea therein shall in relation to any territory be construed as a reference to such part of the sea adjacent to the coast thereof not exceeding three nautical miles measured from the low-water line,” he pointed out. He also stressed the state government was unable to see any justification as to why for the nation (Malaysia), the breadth of the territorial sea is 12 nautical miles whereas for Sabah and Sarawak, it is only three nautical miles. Moreover, no justification had been offered to the state as to why in times of emergency, its territorial waters should be 12 nautical miles, but where there is no emergency, the breadth of its territorial waters should be limited to only three nautical miles, he noted. In an article titled Act 750: Federal government’s latest attempt to plunder the Continental Shelf from all Malaysian states dated June 12, 2014 and sighted in Website Suara Sabah, author and Sabahan rights activist Zainnal Ajamain suggested that states create a motion in their respective Dewan Undangan Negeri to reject the enforcement of Sea Territorial Act 2012. “Parliament is the highest law-making body in the federation but this doesn’t mean parliament can, with impunity, invoke the right to contravene the Constitution in making these laws. “Unless the country is in a state of emergency, the Federal Cabinet does not hold absolute power, provided that all the laws and gazettes made from 1969 to 1971 are still enforceable. “Since the country is no longer in the state of emergency, the Federal Cabinet is just an arm of the government that must comply with the Malaysian Constitution. It no longer enjoys absolute power. On Nov 5, 2015, the Kelantan Legislative Assembly approved a motion to reject TSA. Bernama reported that the state Human Development Education and Higher Education Committee chairman Dr Mohamed Fadzli Hassan, in tabling the motion, said the federal government used the law to restrict the waters off states to three nautical miles from shore. Dr Mohamed Fadzil, PAS MP for Temangan, pointed out that TSA denied Kelantan the right to receive petroleum royalty of five per cent. He added that when the federal government had emergency declarations repealed in 2011, the legislation used to acquire the Continental Shelf and territorial seas off states became void. 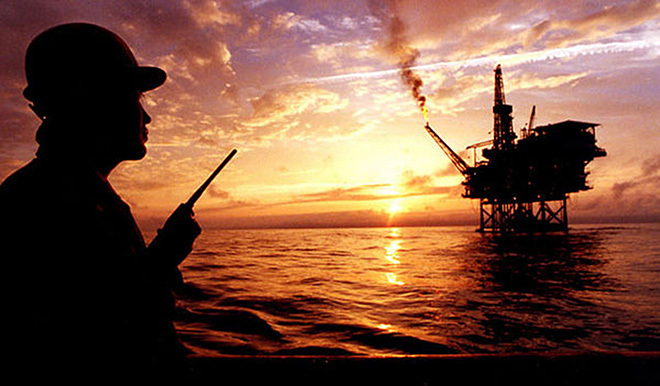 “But the subject of ownership of petroleum (today, an important source of national wealth with current high global energy prices), found both on land and in the Continental Shelf of the states of Sabah and Sarawak, which lies within the boundaries of Sarawak, was never a matter brought up to the Inter-Governmental Committee and hence, not included in its Report. According to Article 1(3) and 2 of the Federal Constitution, the territories of each of the states mentioned in Clause (2) are the territories comprised therein immediately before Malaysia Day and that a law altering the boundaries of a state shall not be passed without the consent of that state (expressed by a law made by the Legislature of that State) and of the Conference of Rulers. While Sarawak (and Sabah) should question their elected MPs on their failure to defend the rights of the states, will the state assembly persons unite in one accord to reject the TSA in the coming DUN sitting from Nov 21 to 30? It will be an unequivocal show of support for Adenan who had on Oct 23 announced the state government would table a motion at the DUN to reclaim Sarawak’s rights. 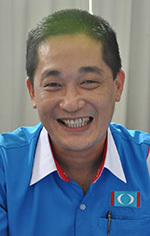 THE TSA bill, moved by Datuk Seri Mohamed Nazri Abdul Aziz and seconded by Dato’ Yong Khoon Seng, was tabled in the parliament on April 18, 2012, and subsequently passed on the same day without much debate. None of the Sarawak MPs present, including those from the opposition DAP — Chong Chieng Jen and the late Wong Ho Leng — spoke against the loss of sovereign rights to the continental shelf. According to the preamble, the passing of the TSA was based on the reason that the Emergency (Essential Powers) Ordinance No.7 of 1969 had — by virtue of Article 150(7) of the federal constitution — ceased to have effect six months after the annulment of the Proclamation of Emergency, 1969.As such, there was no law governing the breadth of the territorial seas of Malaysia. The lifting of the Proclamation of Emergency 1969 was announced by the Prime Minister on Nov 24, 2011. When it was still in force, the Yang Di-Pertuan Agong promulgated the Emergency (Essential Powers) Ordinance No.7 of 1969 which came into force on Aug 10, 1969, to prescribe the limits of Malaysian territorial waters as 12 nautical miles (22.22 km) from the coastline and three nautical miles for all states of the Federation. The lifting of the Proclamation of Emergency1969 had made void all the laws promulgated during the period of emergency. Critics had said while the main purpose of the TSA was to comply with the Law of the Sea Convention 1982 (LOSC), the other purpose was to assume the ownership of all the Continental Shelf and territorial waters off Sarawak and Sabah. The significance of sovereignty over the Continental Shelf is that whoever has jurisdiction over it claims the oil and gas reserves contained therein. The Borneo Post obtained a copy of the Parliament Hansard reporting the debate of the bill. A total of 162 parliamentarians were present when the Bill was moved by Nazri, then Minister in the Prime Minister’s Department. At 3.59 pm on April 18, 2012, parliament started its debate on the Bill — first by Datuk Haji Mohamad Haji Asis (Sri Gading) followed by much ranting from various MPs which bore no relations to the Bill itself. Worthy of mention was a voice from Sarawak — that of Tuan Haji Ahmad Lai Bujang (Sibuti) who asked: “Where is Sarawak inside the Continental Shelf? Sarawak — in front of it is the China Sea whereby we always hear about fishermen’s trespassing into the sea, looked after by Maritime. Ahmad Lai did not press on with his questioning of the rationale behind the reduced limits of the state’s territorial waters to ‘only three nautical miles’. PBB MP for Limbang Tuan Hasbi Habibollah,while declaring support of the Act, expressed concern about how it could affect Limbang. Raising relevant points and speaking against the Act were three PAS MPs and one from PKR. PAS MP for Tumpat, Dato’ Kamaruddin Jaffar, gave a word of caution on the recognition of the sovereignty of states, the states’ sultans and the state legislative assemblies with regard to borders and territories. His debate was followed by a series of questions on oil royalty. “Is this a death sentence to the claim for oil royalty by Kelantan? Does this mean there is a discrepancy for 12 nautical miles generally, and 3 nautical miles for oil? Discrepancy. Or is it discriminatory? Kamaruddin expressed concern that with the Act, these states (Kelantan, Trengganu, Sarawak and Sabah) would lose revenues from their oil and gas. He also raised caution over the two definitions of territorial seas as mentioned in the motion tabled. “We look in detail at the Bill, passed for second reading just now. My reluctance and issue is over the two definitions of territorial seas as mentioned in Clause 3 and Clause 3(1) — that is three and 12 nautical miles for all purposes,” he said. PAS MP for Kuala Krai, Dr Mohd Hatta Md Ramli said in his debate: “I would like to touch on the 3 nautical miles, taking into consideration the meaning in these Acts — Continental Shelf Act, Petroleum Mining Act and National Land Code. “The issue of 3 nautical miles has become the argument of the federal government in denying the rights of the Kelantan state government to claim royalty from the revenue of petroleum products in the sea of Kelantan. “To be fair, when tabling this Bill, why can’t we use the same definition under Clause 3(1) that is 12 nautical miles? The most significant debate came from PKR MP for Batu, Chua Tian Chang @ Tian Chua, who alerted parliament to the fact that the surrender of the boundaries should be acknowledged and recognised by each state. “Since our country is a federation, that means each state has its own sovereignty. 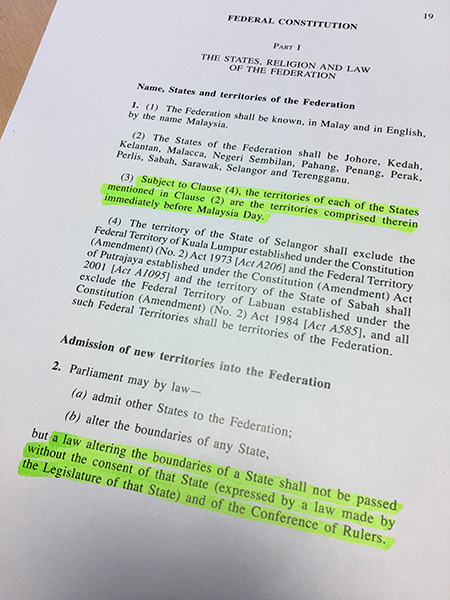 Doesn’t this surrender have to be recognised and acknowledged by Sabah through the Sabah State Legislative Assembly so that they too can rectify the boundaries? There were no records of other MPs, including those from opposition — DAP’s Chong Chieng Jen (Bandar Kuching) and the late Wong Ho Leng (Sibu) — debating the bill.